How can Christians seek racial reconciliation in cultures with deep historical and political antagonisms? 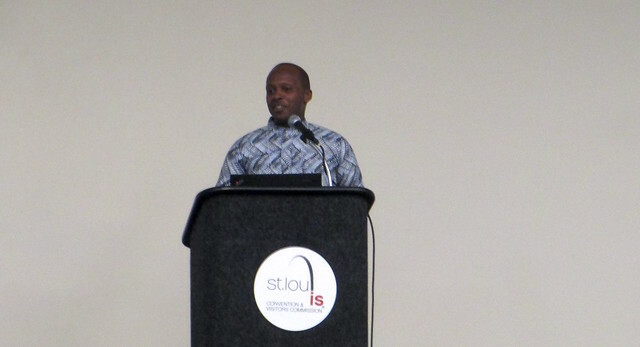 Speaking at Urbana today is Emmanuel Bagumako, general secretary of the Union des Groupes Bibliques du Burundi (UGBB), the International Fellowship of Evangelical Students (IFES) movement in Burundi. He has also done missions work in the US and several African countries. In a context of a growing crisis in Burundi that the UN high commissioner says is heading towards civil war, Emmanuel shares how he maintains hope. Emmanuel starts out the talk by asking how the audience would describe him in one word. One student jokes, “fashionable”, admiring his traditional African shirt, another woman replies, “male”, a black man in the audience says “similar”. The fourth response is “bright” and the final answer is “direct”, causing chuckles throughout the room. Emmanuel says that he wanted to see if the words would be related to race or connected to a specific group of people. He says that we always have a quick assessment of who the person we are meeting is, which then becomes their identity to us. He explains that he was thirteen when he heard about ethnic groups in his country for the first time. He was told that the Hutu and Tutsi were fighting and so he asked what group he belonged to. Perplexed by the response that he was a Tutsi, he wondered how this could be since his father was a Hutu. Emmanual points out that race is only a small part of who we are, and that race doesn’t have a genetic basis. He continues, describing a young Hutu man who grew up in a refugee camp. He was taught from a child that Tutsi were not human beings and were just animals. Another young man, a Tutsi, also grew up in a camp and was told from childhood that if he ever saw a Hutu, he should kill them before being killed himself. Emmanuel quotes Katongole and Rice, “Without reference to an explicit beyond, we are left with versions of reconciliation that offer little concrete hope that fundamental change is possible.” He says that although he speaks from a context of Burundi, these issues transcend the specific struggle between Tutsi and Hutu. They apply to the struggle between whites and blacks, Israeli and Palestinians, and more. He says that these divisions run deep in ourselves but we still hope that we can engage in reconciliation. What lies behind racial definition is identification of people, which will end up being an identity to them. So what is our identity as Christians? We are created in God’s image and recreated in his image (the likeness of His son). When we face strong crises, do we still hold onto this identity? Although we know that every human being is created in God’s image, sometimes this just remains a theory that we believe in and not something that is really at the core of our identities, Emmanuel says, and tells another story. Once, as he was traveling with a pastor who was Hutu, they had to go through a Tutsi area; although they went out of their way to avoid a Tutsi area, they were still stopped by a group of Tutsi, who told Emmanuel that he could either leave the pastor to die alone or stay with the pastor and die with him. Emmanuel faced a crisis, “Who am I? And who is my brother?” By the grace of God, Emmanuel chose to stay and both he and the pastor lived. We are all on a journey toward reclaiming that identity for ourselves. Emmanuel challenges everyone, “How can I understand my race? I can choose to understand it against the other person or from our origins (where we belong).” He says that he believes we can be one: one people, one community, one race and challenges, “Will we continue to define ourselves based on what our society says or what God says?” The problem with racial definition is that people want to identify themselves from others by comparison rather than from their origin as God’s creation or their destiny to become in the likeness of Jesus Christ. This creates insecurities that can have horrible consequences. Racial reconciliation comes from properly comprehending our new identity in Christ. The work of trading our old identity with a new identity in Christ will define a new and one race with the same destiny. So is racial reconciliation a utopia or a realistic goal? Is building one race a reachable target or an unachievable ideal? Emmanuel says that racial reconciliation is both a means and an aim – it is not only an end result of God’s mission, it is also a means to reveal God in missions. Agreeing to not fight each other is not reconciliation, it is just a peace agreement. This happened in Burundi with the Arusha ceasefire in 2000, but without full reconciliation, the fighting had continued until 2005. When facing problems of racial hatred, Emmanuel urges us to seek reconciliation and not just peace. God’s mission is to redeem human beings into His image (identity), says Emmanuel. Mission focuses on the work of creating a new identity. Emmanuel has talked to many college-age students in Burundi who have never lived in a peaceful country. This past May, many students had to flee their campuses fearing that they were being targeted. In light of these tragic events, can we believe that God is doing something? Our identity can be a strength or hindrance in missions, Emannuel says. As we serve within diverse communities, the distance and difference between the missionaries and the communities can either help or destroy the ministry. This is where we have to learn the pattern of God’s mission, the incarnation, where Christ emptied himself to be with people who were very different from himself (see our post on Christena Cleveland’s talk on incarnation and equality at Urbana). The tension between God’s mission of building one community and the growing racial conflicts and destruction of people is becoming more and more serious. We can choose to be spectators, victims, or agents of change. In the 1970’s in Burundi, Emmanuel’s father had to do mission work. Emmanuel was born when his father was in jail because of his fight for justice as a pastor who believed strongly in engaging society. In 1993, in another crisis, his father again put himself at risk. Thanks to his father’s steadfast belief in God’s mission and unwavering stand with the oppressed, Emmanuel’s identity has been shaped to also desire to fight for justice. Through the great lakes Africa conference, he has helped to fight for reconciliation between Rwanda and Congo has also been worked on, although there have been difficulties. How can we move from pretending there are no problems to genuine reconciliation and not just avoid the tensions? Emmanuel says he believes that reconciliation is grounded in our identity in Christ. As Christians, we don’t have to pretend that all is well because, although we may be bad or wrong, it is okay because we have an answer and a solution in Christ. Others can’t embrace reconciliation because they believe that those who say they are wrong are their enemies. However, from a Christian perspective, we already acknowledge that we are sinners and broken but find healing in Christ. “It’s not a problem to have a problem” for us. What is the role of people who are outside conflict in reconciling the conflict? Although we may not believe we are part of the conflict, these conflicts involve everyone, says Emmanuel; and we can all be part of reconciliation. What if you are not actively fighting but you are outside of the conflict? How can we engage? Emmanuel says that if two people are fighting and you are out of the fight, it is important to first understand what is happening and how it affects us and not just the players fighting. Once we understand the roots of the question, we can better engage. In all fights, there are really just two groups: those who understand and those who don’t understand. Do you have any stories of racial reconciliation being achieved? Emmanuel says that the two young men he mentioned earlier, who were enemies since they were children, are now friends and are doing missions together. In May, they stayed together in his house while he had to leave the country for other commitments. In such a time of crisis, this is truly amazing. Although this is on a small scale, change is happening and Emmanuel believes that we can continue, transforming lives one at a time.